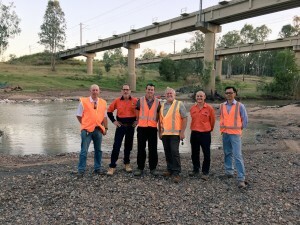 Two major infrastructure projects providing improved flood access for locals in Duaringa are on track for completion by the end of the year. Central Highlands Councillors Charlie Brimblecombe and Paul Bell AM joined CEO Scott Mason and the project team for an inspection of the sites last weekend. A new three-span bridge is being constructed across Herbert Creek at Boolburra Edungalba Rd, which will provide all-weather access out to the highway for residents in the area. The $1.25 M project began in early September and is due to be finished by 30 November 2016, weather permitting. The second development involves the construction of a low level crossing at Aroona Rd. The $1.4 M works will provide a shorter route to the town centre for residents in the area during times when the river flows are low. This will allow continued access to social and commercial services in Duaringa. The crossing is expected to be completed by 30 December 2016, weather permitting. Both projects are funded by the Queensland Betterment Fund, a state government initiative supported by the Commonwealth Government as part of the National Disaster Relief and Recovery Arrangements (NDRRA). ‘It was great to get out there and see these innovative projects coming to life,’ Cr Brimblecombe said.